Moms, with summer winding down and school about to start, are you and your girlfriends ready for a “Mother’s Day Out?” Better than butter, and a short drive from Lakewood, is Paula Deen’s new restaurant and retail shop, “The Family Kitchen,” in Fairview. We both fell in love with the blue and lavender cast iron cookware, the rooster tea kettle and the deviled egg plates (Wicked Hens Lay Deviled Eggs). Bowls, platters and aprons were full of clever Paula Deen witticisms and it was all done with a touch of class. The pet line featured food bowls, floor mats, dog and cat food, and treats. If you are in the market for a teacher or neighbor’s gift there is no limit to the choices. Beautifully packaged were items like Paula’s bourbon sauce, house seasoning, sweet potato butter and a variety of cake and baking mixes. It was lunch time, and we were ready for some “down-home cooking.” The food is served family style and shared. 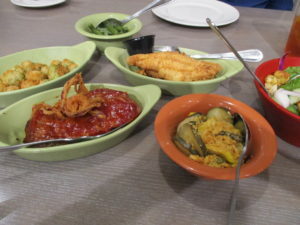 Selecting two meats and three vegetables, my friend and I chose fried catfish, meatloaf, squash, green beans and salad with poppy seed dressing. The prices were reasonable and the servings generous but, most of all, the quality of the food was excellent. Our server, Daniel, was delightful. He even brought us a helping of black-eyed peas since we had not ordered some and he said they were his favorite side. He was correct in his praise for the peas. They were perfectly cooked and seasoned. The drive from Dallas takes only about 35 minutes, so you can leave after morning rush hour and be home by the time the kids are out of school. Put this on your “to do” list for a fun outing this fall.